This article was updated Feb. 6 at 11:01 a.m. EST. President Trump's State of the Union address offered few details on his infrastructure plan, and he gave even fewer yesterday in his speech at the Republican retreat. So as Republicans huddle in West Virginia to game out their agenda, they're working within some pretty broad parameters: Federal spending will constitute only a fraction of the $1.5 trillion package. Regulatory and permitting changes to speed construction will be a main feature. And Trump seems focused on roads. Congress will shape the details of the package, leaving open the potential for climate mitigation and adaptation to get some attention (even if Republicans don't want to call it that). Here are four climate-related questions about Trump's big push on infrastructure. Will roads and bridges account for future flooding risk? 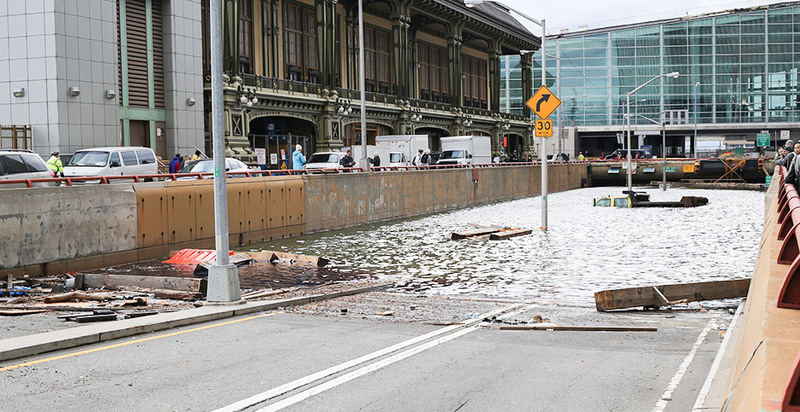 Trump in August axed former President Obama's executive order requiring federal infrastructure to account for rising sea levels and heavier rains. The White House has said it will issue a replacement, but five months later, nothing has been proposed (Climatewire, Jan. 5). Now, with Trump talking about repairing existing infrastructure, resilience experts worry that these projects may have a soggy future. "We've been making mistakes with infrastructure for decades and decades," said Larry Larson, a senior policy adviser with the Association of State Floodplain Managers. "I don't think the federal taxpayer should invest in any infrastructure that doesn't account for future conditions. ... It's just a stupid investment." It's smart to pay a little extra to protect infrastructure against future floods, he said, but the skimpy Republican proposal will already have trouble drawing matching funds from state and local governments. Getting even more to make them resilient will be tough. One tactic that has worked in southern Louisiana is to elevate roads so they can serve as levees, too — essentially knocking out two infrastructure projects at a reduced cost, said Michael Hecht, president of the regional economic development organization Greater New Orleans Inc.
Will levees, sewers and green infrastructure get some attention? American water infrastructure hasn't kept pace with flood risk, and a leaked draft of the administration's proposals includes stormwater, flooding and water control infrastructure. "Some of our [water] infrastructure, frankly, is an international joke," said Ed Thomas, president of the National Hazard Mitigation Association. "Our levees, such as they are, meet no known standard of engineering excellence in the civilized world," he said. 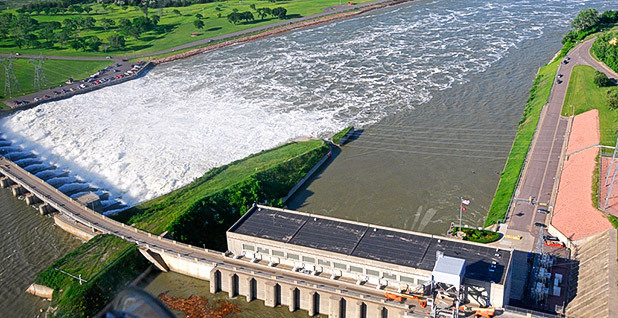 There are about 30,000 miles of levees in the United States, and only about 12,000 are in good shape, Larson said. Often, farmers would throw up dirt mounds to protect their fields — and as the years passed, those farms became subdivisions without any fortifications to the levees. As flood risk has grown, many levees have settled, eroded and been burrowed into by small creatures, he said. Other parts of the water system are in trouble, too. Cities have built many of their sewer plants along the coast or near rivers to reduce operating costs, but now those facilities face greater chances of inundation, Larson said. Water supply facilities are the same. Flooding in 1993 shut off the water supply in Des Moines, Iowa, for two weeks, and more municipalities could face the same problem unless those facilities are hardened. If Republicans are looking for economic returns on infrastructure investments, resilience experts are likely to steer them toward green infrastructure, like rebuilding wetlands, as a relatively inexpensive way to buffer floods from heavy rains. "It has an economic function to it, [just like] a road or a bridge," she said. 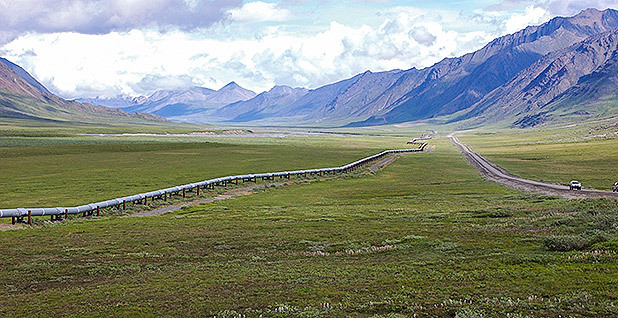 Does energy infrastructure get in on the action? Energy companies see the potential for an infrastructure push to make it easier for pipelines to earn permits — especially in the Northeast, where local opposition has played a role in halting development. The American Petroleum Institute has pitched pipelines as infrastructure projects that need zero public investment. And lawmakers from energy-rich states have been eager to open more markets for their states' commodities. After the State of the Union, Sen. John Barrasso (R-Wyo.) mentioned that energy infrastructure could have a role in the president's plan. And earlier this month, Sen. Shelley Moore Capito (R-W.Va.) said New England's need to import liquefied natural gas from Russia suggests the need for more pipelines, despite local objections (Climatewire Jan. 24). Is there a gas tax? Some influential Republicans, like Transportation and Infrastructure Chairman Bill Shuster (R-Pa.), say they are open to paying for all this by bumping up the gas tax (see related story). That could drive down greenhouse gas emissions. Research by the National Bureau of Economic Research suggests gas taxes lead people to drive less in the short term and make people more likely to invest in low-emissions vehicles in the long term. The NBER estimates that a 10-cent gas tax increase could lower total U.S. carbon emissions by 0.5 percent — the equivalent of offsetting half a year in emissions growth, according to the organization. The U.S. Chamber of Commerce is pushing for even more than that: 25 cents per gallon.